Practical and adorable, these felt-wrapped, unscented soaps are ideal as a body bar, or at the sink, gently cleaning the hands and feet of kids, crafters, beachcombers and gardeners. Felt wraps are made of 100 percent wool. Quilters love our decorative felted soaps for use as pincusions. 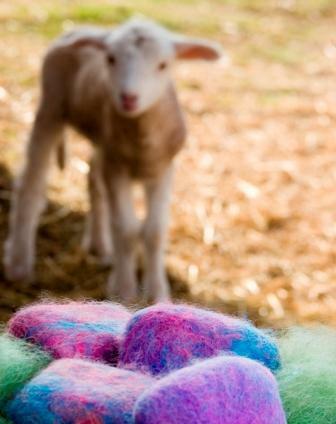 An all natural, soft soap is wrapped in wool felt which cleanses needles and pins, and keeps them super sharp.